Today we review 7-Keto, a weightloss supplement by Nature’s Sunshine. As the name suggests, the main aim of the supplement is to help your body get into a state of ketosis. The manufacturer says that the product is a natural boost to metabolism and can help with optimal thyroid functioning. Thyroid functioning and hormone production is essential to regulating metabolism and fat burn in the body. The main ingredients are 7-Keto and chickweed leaf extract, with the rest being inactive ingredients. 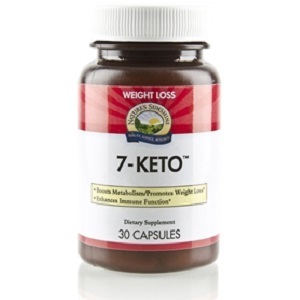 7-Keto is a safe, natural metabolite of dehydroepiandrosterone (DHEA), and is not converted to either androgen or oestrogen although some other DHEA metabolites. As a metabolite, it is necessary for metabolism to take place in the body. DHEA is a naturally occurring endogenous steroid hormone in the body produced by the adrenal glands. As an added benefit, 7-Keto may increase the thyroid hormone, T3. 7-Keto also raises immunity levels by aiding white blood cell function. The product comes in the form of gelatin capsules. Take one capsule a day. You should take these capsules with meals. If you have hyperthyroidism, consult with your doctor first before taking this supplement. Also clear use if you are pregnant or breastfeeding. There do not appear to be any allergens in this formula. A bottle of 30 capsules retails for $63.90 on the product website. This is quite high compared to other keto supplements, especially as the bottle will last only one month. However, there is a membership discount – you will pay $42.60 if you are a member. You are eligible to become a member once you check out with $40 of Nature’s Sunshine products and sign up. A 90-day money-back guarantee is in place. You can return both used and unopened bottles for a full credit. As a one-pill product, 7-Keto is easy to use and incorporate as part of your diet. The metabolic increase provided and thyroid hormone adjustment for the better may be an aid to weightloss. The manufacturer’s confidence in its product is also evidenced in its 90-day moneyback guarantee. However, it is unrealistic to expect 7-Keto alone to help you achieve a state of ketosis – the fact is you still need to make dietary adjustments of your own, and this needs to be amplified more by the manufacturer. In this formula, we do not find any evidence of appetite suppressant qualities. This means you will need to manage both calorie intake and going into calorie deficit through exercise on your own. As such we do not find this to be a comprehensive formula. Additionally, it is also very expensive compared to other high quality keto supplements, even with the member discount. Finally, there are also no ingredients specifically targeted at burning existing body fat and preventing new fat from forming or being stored. This could have been achieved by adding specific ketones or enzymes, which are missing from this formula. John Parker	reviewed Nature’s Sunshine 7-Keto	on May 10th	 and gave it a rating of 3.5.